Dr. Judy Shepherd at an equator mark on the highway to Katovu and Mabarara. Study Abroad students will visit both towns. 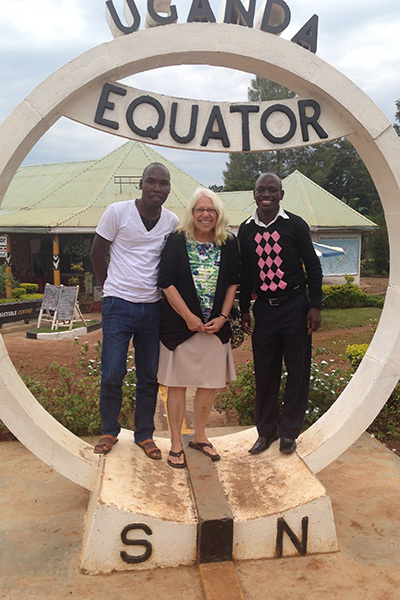 This summer, students can literally stand on both sides of the world — one foot in the northern hemisphere, the other in the southern hemisphere — as part of a 15-day Study Abroad program to Uganda. 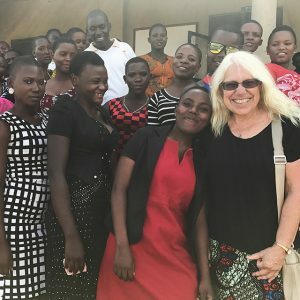 Led by Dr. Judy Shepherd, Women and Development in Uganda will give students a firsthand look at the development challenges and opportunities in what Winston Churchill called “the Pearl of Africa” for its natural beauty and rich cultural heritage. Open to only 15 students, the academic program includes visits to micro-credit projects, health clinics, and a refugee resettlement community. Additionally, students will participate in a service learning project at the Widows and Orphans Support Organization, a community-based non-governmental organization (NGO). Alongside faculty at Mbarara University of Science and Technology, Dr. Shepherd will facilitate the lectures and discussions that comprise the 3-unit SDSU course. 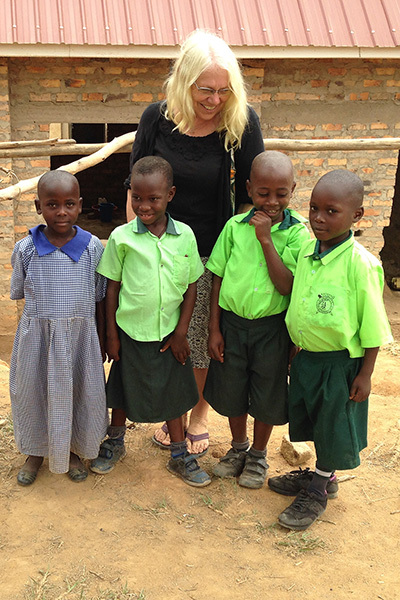 In between her two trips to Uganda, Shepherd began part-time work as a lecturer in SDSU’s School of Social Work, teaching social policy and macro practice skills — empowering clients by involving them in systemic change. The summer abroad program, May 26–June 9, includes a visit to Queen Elizabeth National Park, famous for its wildlife; and a day in Kampala — Uganda’s capital — with stops at the U.S. Embassy and the Kabaka’s Palace and Parliament. Kabaka is the title of the king of the Kingdom of Buganda, the largest of the traditional kingdoms in present-day Uganda. Students will also visit Gaddafi Mosque, named after former Libyan Leader Muammar Gaddafi, who provided the funds for its construction; and enjoy a performance by a traditional dance group. Participation will be encouraged. Uganda: Women and Development in Uganda is one of more than 20 fascinating programs throughout the world this summer, led by SDSU faculty. Dr. Shephard answered a few question about her program, and her career. I hold a master’s degree in social work from West Virginia University and a Ph.D. in social work from the University of Illinois in Champaign-Urbana, where I specialized in community organizing and conducted my dissertation on the organizational development of one of the oldest battered women’s shelters in the U.S. I conducted trainings for the battered women’s shelter in Illinois and served on the board of the shelter in Fairbanks, Alaska. I lived and worked in Fairbanks, Alaska for 17 years, serving as chair of the social work department at the University of Alaska Fairbanks for eight years. While chair of the department, I started a statewide distance bachelor’s degree in social work through teleconference, and a cohort-intensive bachelor’s degree program for Alaska Native students living in remote regions. Both of these programs are still going and have had a major impact on providing trained mental health practitioners in rural Alaska. Dr. Judy Shepherd with students of a primary school where the Widows and Orphans Support Organization has a sponsorship program and activity days. Tell us a bit about each of the highlights of the Uganda program. In Queen Elizabeth Park, you can see elephants, zebras, hippos, water buffalo, tree-climbing lions, monkey, and many antelope. Students are surprised to learn how many national parks there are in Uganda and the abundance of wildlife. 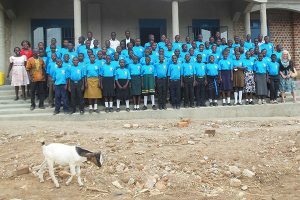 The Widows and Orphans Support Organization is a local community group that I helped found with a former student I taught in Uganda in 2012. This group does amazing work with widows in a micro-credit program, critically vulnerable children in a school sponsorship program, and with secondary students at a school built by the project with community members. Mbarara University of Science and Technology is a well-respected government university that has a School of Interdisciplinary Research which includes departments of Community Engagement and Service Learning, Human Development and Relational Sciences, and Environment and Livelihood Support. The faculty of this school are currently involved in research projects on community perceptions of gender-based violence and sexual reproductive health education in the public schools with young adolescents. They will thus provide us with information and discussions on gender-related topics and accompany us to organizations working on issues related to women. A secondary school started by the Widows and Orphans Support Organization where Study Abroad students will do their service learning project. Nakivale Refugee Resettlement is a community in Uganda where many individuals fleeing violence in bordering countries such as Congo have relocated. We will take a day trip to the camp from Mbarara University. At this visit, students will learn about the refugee situation in central Africa, and services that are provided in settlements. On the last day of our program, we will travel to the nation’s capital, Kampala, and meet with staff at the U.S. Embassy to learn about what the U.S. government is doing in relation to HIV/AIDS prevention and support, addressing gender-based violence, and health and education service provision. What types of service learning projects will the students do? This will be based on the needs of the project, but since we will be with a project that has a secondary school with 200 students, we will most likely assist these students with English tutoring and play educational games with them. We will also help the widows in the micro-credit program with projects to assist them in keeping a sanitary compound. Who are some of the guest lecturers? The guest lecturers at Mbarara University will include Ph.D. students doing work on gender relations; the dean of the faculty of interdisciplinary research, who will talk about their research with early adolescent girls on sexual and reproductive health knowledge; and a lecture by a faculty member working on land-use issues and how they impact women. What’s it like chaperoning young people on such an adventure? Chaperoning trips like this is enjoyable. It’s fun to watch students discover a new country and make friends with the people they meet. Dr. Judy Shepherd and students of the WOSO secondary school at a celebration. Do you have a favorite anecdote or small-world experience from Uganda? I have had former students visit me in Uganda, and one of the things that most surprises them are the boda boda motorcycle taxis used throughout the country, and are often seen carrying up to three passengers, or goats, chickens or even mattresses and bed frames. The local food is very healthy. Lots of fresh vegetables (matoke—a dish made from baked green bananas with a ground nut sauce is very common), fish, chicken, beans and rice; and pineapples, watermelon, bananas and papayas. I wanted to be a mother, forest ranger, writer and social worker. Anything you’d like to say to students considering this Study Abroad program? I think this course to Uganda will be very special because we will be with Uganda graduate students and faculty from Mbarara University, and we will be visiting a locally based community project that I have been involved with for five years. A lot of attention has been paid to safety for this program. We will have university drivers and be in secure accommodations. Also, we will get out in the countryside and visit deep villages and an amazing national park. The deadline to apply is March 15. Students from other universities are welcome; check to see if the credit earned is transferable. For more information, and to see the many other Study Abroad options, visit neverstoplearning.net/studyabroad, email FacultyLedStudyAbroad@sdsu.edu or call (619) 594-9400.